No generations of Torringtons had lived anywhere particularly, as far as they knew. They were a wandering, needs-must sort of family, who made their living disparately, in clerking, mills or shipping; travelled to France for work in tailoring, or stopped at home in Somerset, Shropshire or Suffolk, to play some minor role in greater prospects; designing a lowly component of a reading cathedral or a girdered bridge. Some had been in business, one or two in service; there was an artist, some soldiers, all dead. All dead. When Sadie Jones’s novel begins, the Torrington family has been settled at the manor house called Sterne for a generation. Horace Torrington had bought the house “rashly at the peak of what transpired to be transient — too harsh to call it flukish — financial success.” Now, Horace is dead, and his wife Charlotte has remarried. Her new husband, Edward, much reviled by the Torrington children, is going to Manchester to seek a loan to save the house. Edward leaves on the birthday of the eldest daughter, Emerald, a practical young woman with a secret romantic streak. She and Charlotte, along with Clovis, Emerald’s brother, spend the day preparing for a dinner party to celebrate Emerald’s birthday. The guests will include John Buchanan, an eligible bachelor farmer from the neighborhood, and Emerald’s school friend Patience Sutton and her mother. Meanwhile, the youngest Torrington daughter, the often-forgotten Smudge, is preparing for her own Great Undertaking involving a pony and some charcoal and Smudge’s particular ideas of art. The carefully made plans for the evening first begin to go awry when Patience Sutton arrives with her medical student brother Ernest, there to take the place of his mother who is sick with flu. They bring with them news of a nearby train derailment. The railway has asked the Torringtons to open their home to some of the survivors, and so they do — resentfully — stuffing the survivors into the morning room and forgetting about them, or most of them. One survivor, Charlie Traversham-Beechers, arrives after the others and wheedles his way into the family party. His presence distresses Charlotte, who has a mysterious history with him, but Clovis is oddly fascinated with him. Charlie exhibits an uncanny ability to manipulate everyone, from the other train survivors to the Torringtons and their guests, and the ability becomes increasingly sinister as the night continues. This book took me by surprise again and again. In the beginning, it reads like a light family comedy with a hint of romance, but set in the Edwardian era. Jane Austen meets Downton Abbey. The family members’ passive-aggressive selfishness leaves plenty of room for drama, but the narrative tone is arch and gently chiding. The arrival of the train passengers, especially Charlie Traversham-Beechers, brings a sense of unease to the proceedings. The circumstances, and Charlie’s needling, bring all the family’s worst impulses out into the open. This book was published in the UK and Canada earlier this year. The US release is May 1. I’ve read very mixed reviews for this novel, although I think I’d still like to read it when it comes out in paperback. It does seem to be the shifts in tone and genre that leave readers bewildered. You say you felt cheated, Teresa – does that mean that ultimately you didn’t enjoy this or rate it very highly? On balance, I did enjoy this; it was sufficiently entertaining. Initially I felt cheated at some of the revelations, but I think my mind wasn’t reading some of the clues correctly. I haven’t quite made up my mind if the fault was in me or in the book. You had me at “Jane Austen meets Downton Abbey.” Have already put a hold on it at the library, which has copies on order. 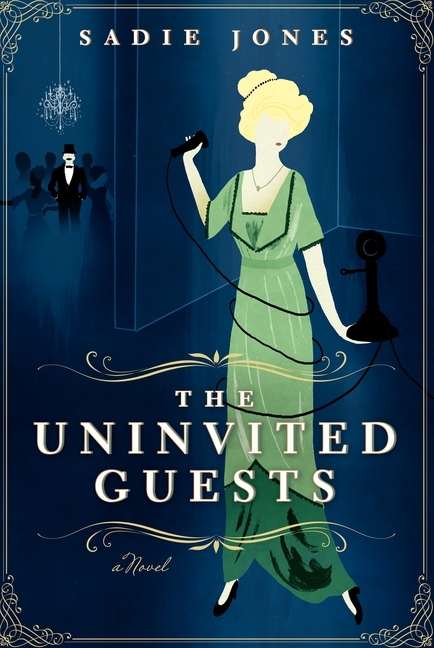 I have started reading this, and was unsettled by little things, like the way they ignore the youngest child and then do something for her in a weird Edwardian children’s book style before ignoring her again, except that so far she hasn’t had any adventures possible because of their neglect. Yes, the way they treat Smudge is terrible–that’s pretty much true of the way they all treat each other. Smudge’s adventure is pretty much only possible because of their neglect, and I alternated between finding it hilarious and alarming. I ended up finding it hilarious. It was like an older book with chapters from a newer one. How odd, and maybe fun? Do you think I’d like it? Odd is right, and both fun and disturbing. I think you’d like it. I’m very intrigued by your review & pleasantly surprised that my library system already has this on order as well. I see that that the Publishers Weekly review compares the opening to a mix-up of P.G. Wodehouse and Dodie Smith, which would have sold me just as much as Jane Austen & Downton Abbey. Yes, I can see the Wodehouse and Dodie Smith. Very fitting. I’ll be interested to know. I think reactions to this will vary a lot, but I think you’ll like it. This is one of those books that I’m pretty sure I’d purchase based on the cover alone :-) Nice to see it’s also got some goodies inside, even with the unexpected surprises. The cover is great, and it fits the book well. Were the reveals too gut-punchy, can I ask? Or would it be the case that a girl who read the end before reading the middle would be unable to discern what had happened in the middle? As was the case with Fingersmith, and that was why I didn’t love it the way I wanted to, until I read it for a second time. The reveals weren’t particularly gut-punchy, no. It’s more that I thought I was reading one kind of book and it turned into a different kind of book. Not a big, revelatory twist, just an angle that didn’t occur to me at all. I did read the end before reading the middle, and was completely unable to fathom what had brought them to that point. I really loved this book! It took me by surprise too- I was expecting something completely different! I really thought it would just be silly fun, but then it got all sinister, which I really enjoyed. Thanks for letting those of us who haven’t read it know a little bit what to expect (as far as it turning sinister, that is). The sinister bits really took me by surprise–this book is filled with surprises all the way through.